Sedliačiková, M., Hajdúchová, I., Krištofík, P., Viszlai, I., and Gaff, M. (2016). "Improving the performance of small and medium wood-processing enterprises," BioRes. 11(1), 439-450. This paper investigates the financial aspects of small and medium enterprises (SMEs) in the Slovak wood-processing industry. The aim of the survey was to determine the level of understanding and implementation of financial controlling, and to identify its potential for future implementation. The survey revealed a low level of understanding and implementation of this tool in Slovak wood-processing SMEs, because the use of all analyzed instruments of financial controlling was in small enterprises in a range of 15% and in medium-sized enterprises up to 40%. However, medium-sized enterprises were substantially more equipped than small enterprises at applying and recognizing the benefits of financial controlling. Based on the results of this research, the framework for a standardized model of financial controlling for Slovak wood-processing SMEs was proposed, as a practical way of improving company performance models. The concept of controlling first appeared as a business management model in the second half of the last century. A comprehensive review of the concept and its development in English and German language literatures was provided by Eschenbach’s research (2004). His book was based on twenty years of research by thirty members of a research group from the Institute of Business Management at the Vienna University of Economics and Austrian Controller Institute. It also draws on the work of Baumgartner (1980), Drucker (1981), and Anthony (1988). From results obtained within the analysis of secondary sources, it can be concluded that controlling is being carried out in enterprises in the various functional areas, the area of ​​cost – cost controlling, the area of investment – investment controlling, and in the finance area – financial controlling, etc. preparation of financial forecasts (forecast, estimate). 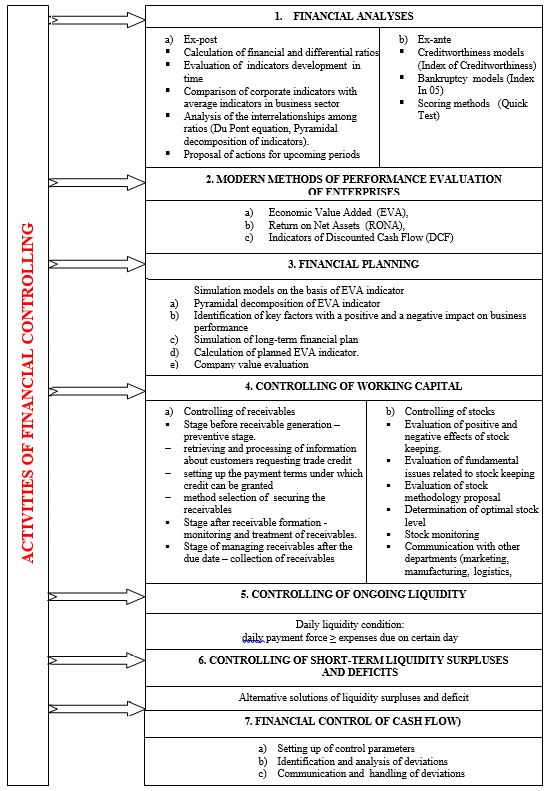 These techniques, procedures, and methods of financial controlling serve as a support tool for optimal decisions in finance that should be adopted by enterprise management (Bieliková et al. 2014). The effectiveness of this model is determined by the quality of the controlling tools, methods, techniques, the consistency of the planning and control mechanisms, and the standard of the information systems (Claussen 2003; Fischer 2012). Slovak and Czech authors have reported the implementation of the principles of financial controlling in a corporate management situation, as have Freiberg (1996), Foltínová (2009), Havlíček (2011), and Sedliačiková (2015), among others. These authors point to the importance of controlling as a financial instrument that allows the preparation of variants for the preparation of optimal management decisions in the field of finance. Eschenbach (2004) pointed out that the application of controlling in enterprises varies depending on the type and size of the business. Furthermore, there has been the potential to improve SME performance with controlling measures in place. This was the main motivation behind the analysis of the controlling principle application in SMEs, as reported by Sedliačiková et al. (2012), and is the motivation for this paper. SMEs are a crucial part of the economic potential in most countries of the world, and this is so even in the case of the Slovak Republic. A clear and explicit definition of terms ‘small’ and ‘medium’ does not exist. Approaches to definition of a SMEs are therefore different from author to author. Their division, especially quantitative, is different depending on the size of the national economy and on the belonging to branches of the national economy (Úradníček and Zimková 2009). According to the European Commission, small and medium size enterprises represents those enterprises that employ fewer than 250 persons and whose annual turnover does not exceed 50 million € and / or total net amount of assets is not exceeding 43 million € (Benčíková et al. 2013). This present case study analyzes the financial controlling application methods of SMEs in the Slovak wood-processing industry. The proposed method provides an effective performance management tool for SMEs. This is particularly valuable in the current turbulent economy. At present, SMEs are the main engines of economic growth and often become the carriers of innovation and modernization of the technological and manufacturing processes (Závadský and Hiadlovský 2014). Therefore, it is desirable to create conditions for the sustainable development and growth of SMEs (Lesáková 2008; Ismail 2011). The current theoretical knowledge and practical experience of wood-processing SMEs were investigated using a questionnaire to evaluate the method of financial controlling. The results provided reliable feedback on the level of application of financial controlling methods. Commonly applied in unstable macroeconomic and microeconomic environments, this method provides valuable techniques for beginners, as well as experienced entrepreneurs, and also proposes the implementation of a financial controlling model for those enterprises that are lacking, or have minimal knowledge and experience in that area. This paper deals with the issue of financial controlling and its application in Slovak wood-processing SMEs, based on their own experience and the results of several research projects. The application of financial controlling in business practice of SMEs aids the management of both cost and revenue. As Klieštik et al. (2015) state, this contributes to the possibility of increasing efficiency and tax optimization in the company, and also allows the use of more effective tools in the management of cash flow. The overall effect is to reduce the risk of primary (inicial) insolvency (it is caused by the company itself) and secondary insolvency (it is caused by customers who do not pay on time) and thereby to strengthen the financial stability of the company (Musa and Musová 2010). Therefore, the objective of this work is to explore the idea of financial controlling of Slovak wood-processing SMEs. This research reports the financial controlling systems from a random sample of SMEs, and focuses on the current state of awareness and use of financial controlling, and its potential to improve performance. The research methodology consisted of three phases. In the first phase, methods of summary, synthesis, and analysis of the field were used, and a short review was prepared. In the second phase, a questionnaire was administered to generate empirical data on Slovak wood-processing SMEs. The questionnaire results were evaluated using descriptive and statistical method – multi-factor analysis of variance (MANOVA). In the third phase, a model of the financial controlling for wood-processing SMEs was designed. Every model used economic, social, or biological systems as set out by Mitro et al. (2008). The proposed used social and economic systems and it was based on the implementation experience of previous models. The model should help enterprises create a compact reporting system that will improve the financial performance of wood-processing SMEs. Part B – 7 questions: Financial controlling (F2 – F9). Part A recorded the enterprise characteristics of size (small or medium), type (trading or manufacturing), and length of existence (up to 1 year, up to 5 years, up to 15 years, or over 15 years). Part B aimed to identify the state, level, and rate of implementation of financial control methods in selected enterprises, as well as to identify potential interest of selected SMEs in the solved issue. where n is the size of the sample set, is the values of the standard normal random variable (reliability specified at the 95% level, i.e. α = 0.05 corresponds to z = 1.96), Δ p is the required exactness (error of estimation determined at 5.65%), and p is the ratio (relative frequency) quality sign in the basic set (determined at 50%). The actual sample size was 193 SMEs, which presents the 38.6% returned questionnaires of the total questionnaires sent. This was considered to be a representative sample size. Based on previous research by Matejková (2012), the minimum sample size would be significant at 150 companies. The reduced sample size increased the error of estimation to 7.05%. The survey data were evaluated based on descriptive, graphical, and statistical analyses. The multi-factor analysis of variance (MANOVA) technique was used to determine significant differences between the three factors: the size of the company (A1), the type of company (A2), and how long it had been in existence (A3). All statistical analysis and graphical presentations were done using the STATISTICA 10.0 statistical software. The qualitative questionnaire variables were analyzed by assigning numerical values to the answers, on a scale of 1 to 3. Value 1 was assigned to answer – yes, the instrument is used in the enterprise, value 2 – the instrument is used in the enterprise partially and value 3 – no, the instrument is not used in the enterprise. It means that the number one has marked the answer that represents the maximum degree of financial controlling tools implementation. Points were increased with decreasing the level of implementation of the instrument. The results for manufacturing and trading companies are shown in separate panels (Figs. 1 to 6). The horizontal axis shows the A3 factor (up to one year, up to five years, up to 15 years, or over 15 years), and the A1 factor (small, medium, or large companies). Numerical values are recorded on the vertical axis, which represents point scores of individual answers. However, the numerical scale on the vertical axis is in all MANOVA graphs in range from -2 to 5. In this range it is possible to illustrate the variance form median. These values represent the answers to particular questions. All of the results are presented as point estimates with their associated 95% confidence intervals. Statistical significance is defined by the associated p-value. The values of p ≤ 0.001 mean that the differences are “very highly significant” (99.9%). In case when p is in range 0.001 < p ≤ 0.01 – it means the differences are “highly significant” (99.0%) and when p is in range of 0.01 < p ≤ 0.05 then the differences are “significant” (95.0%). If p > 0.05 then the difference is “non-significant” (90.0%). To determine the level of understanding and implementation of financial controlling in Slovak wood-processing SMEs were used the following criteria (Table 1). Small enterprises have lower capacity, personnel and financial opportunities for financial controlling. For this reason, the thresholds for determination the understanding and implementation of financial controlling are designed separately for small enterprises and medium-size enterprises. The methodology and techniques of financial planning were used by only 9.7% of small and 39% of medium enterprises. The MANOVA results revealed significant differences between small and medium enterprises and between trading and manufacturing enterprises, in favor of manufacturing enterprises. The age of the enterprise seemed to have had no influence over whether or not the company uses financial planning, except for small manufacturing enterprises in operation up to 15 years (Fig. 2 and Table 3). Controlling activities that support the management of liquidity (working capital, ongoing liquidity, and short-term liquidity surpluses and deficits) are used in only 4.8% of small and 16% of medium enterprises. The MANOVA results confirmed that working-capital controlling processes are used more in manufacturing than in trading enterprises (Fig. 3 and Table 4). In controlling ongoing liquidity, there is a significant difference between small and medium enterprises, in favor of medium enterprises. In addition, there are differences between manufacturing and trading enterprises in favor of manufacturing (Fig. 4 and Table 5). When examining their application of tools for controlling short-term liquidity surpluses and deficits, the size, type, and age of the enterprise did not play important roles (Fig. 5 and Table 6). Financial control techniques aimed at analyzing and monitoring the causes of variations in the cash flow are used by only 6.5% of small and 35.7% of medium enterprises. Multi-factor analyses of variance indicated that medium-sized enterprises and manufacturing enterprises are significantly different because they use these techniques more commonly (Fig. 6 and Table 7). It was found that 38.6% of small and 41.7% of medium enterprises would welcome an informative seminar on these issues. This indicates a relatively high interest to learn more about financial controlling. Multi-factor analyses of variance indicated that medium-sized trading enterprises were not as interested in seminars as their time in business decreased; however, for medium-sized manufacturing enterprises, interest grew with the age of the enterprise. For small-sized enterprises, except for trading enterprises up to 15 years old, interest in a seminar on financial control declined with age, perhaps because of a lack of money for this type of activity. However, only 5.1% of small enterprises and 19.5% of medium-sized enterprises had positive expectations of their future implementation of financial controls. On the contrary, some enterprises, and especially medium-sized enterprises, were actively trying to remedy their shortcomings. The multi-factor analyses of variance showed that the interest of medium-sized enterprises in implementing financial control increased with their age; however, this was not true for small-sized enterprises. From the results and findings of empirical research it can be concluded that the level of understanding, as well as implementation of financial controlling in SME, was generally low, because the use of all analyzed instruments of financial controlling is in small enterprises in the range of 15% and in medium-sized enterprises up to 40%. Controlling financial results can be applied in small and medium-sized wood and furniture companies (Šatanová 2005; Sedliačiková 2010; Sedliačiková, Šatanová and Foltínová 2012). It can be concluded that compared to the previous findings, there was a slight increase in the use of the instrument in practice of Slovak wood processing SMEs. This is a positive trend in the perception of instrument’s benefits and its subsequent implementation. Presented empirical research, however, enriched the above named studies on findings in the categorization of companies in terms of factors, such as company size, type of business and length of the operation on the market. The studies were also enriched with the proposed implementation model of financial controlling in SMEs. The theoretical and practical importance of financial controlling is to ensure the financial health of enterprises (Blazek et al. 2002). Considerable diversity of opinion about what qualifies financial controlling has resulted from the analysis of these approaches and is reflected in the works by authors. For example Foltínová and Belan (1997) limit financial controlling to working-capital, ongoing liquidity, and short-term liquidity surpluses and deficits. This approach can be regarded as very constrained. On the other hand, Freiberg (1996), Blazek (2002), Claussen (2003), Taets von Amerongen (2003), Fickert et al. (2003), and Fischer (2012) have enriched this approach with financial planning and control, which is a broad interpretation of the previous approach. Horváthová and Gallo (2003) have stressed the determination of the financial policies and objectives of the business, the financial and economic analysis of a company, as well as modern methods for the evaluation of business performance. However, their approach does not include financial control. It can be stated that the current business and economic theory and practice express significantly different opinions of domestic and foreign experts on the content of financial controlling, as well the unclear definition and division of tasks between the financial controlling and financial management. These authors are dealing with the issue of financial controlling, regardless of its application in terms of enterprise size. The present empirical research shows that there is no unified set of monitoring and appraisal methodologies for financial control amongst Slovak wood-processing SMEs. Our proposed model for financial controlling (Fig. 7) consists of methodologies and processes that include seven basic key areas. The findings suggest that the implementation of this model can help enterprises create a compact control reporting system in this area of corporate finance. The fundamental premise of this model is that the role of financial controlling is not limited to decision making, but to prepare methodological procedures and alternative solutions for the management of the company on the basis of which of those decisions can be made (Eschenbach and Siller 2011). As reported Drábek and Halaj (2008), the optimal financial management decisions are a prerequisite for the growth of enterprises performance. The increasing of enterprises performance is also the main aim of the proposed model. The current business theories and practices of wood-processing SMEs are defined differently among domestic and foreign authors/experts on the topic of financial controlling. There appears to be a division of tasks between financial controlling and financial management. This case study of Slovak wood-processing SMEs resulted in the proposal of a financial controlling model for SMEs to improve performance. Realized empirical research mapped out the real situation in the study area in the Slovak wood-processing SMEs. A lot of inspiring information was revealed in the surveyed work about the possibilities of implementation, the use and benefits of financial controlling for those enterprises, which would like to build their financial health and competitiveness of the enterprise with tools that financial controlling offers them. In this case study sample, the SMEs level of understanding, as well as implementation of financial controlling, was generally low, because the use of all analyzed instruments of financial controlling is in small enterprises in a range of 15% and in medium-sized enterprises up to 40%. Medium-sized enterprises and manufacturing enterprises mostly recognized the benefits of financial controlling as a supporting tool for the financial management and financial health of the company. Conversely, fairly new, small manufacturing enterprises exhibited the least appreciation for the usefulness of financial controlling. An analysis of variance confirmed that either enterprise size or type and trading or manufacturing, were statistically significant factors in determining results. The age of the enterprise (up to 1 year, up to 5 years, up to 15 years, or above 15 years) was a statistically non-significant factor in all of our questions. Although some SMEs have applied these methods to some extent, the empirical research has not identified the use of a comprehensive set of tools and techniques for financial controlling in Slovak wood-processing SMEs. From the findings, it can be concluded that the business-economic practice of wood-processing SME’s in this field is inconsistent with the modern best theory and practice. The authors are grateful for the support of the Scientific Grant Agency of the Ministry of Education, Science, Research, and Sport of the Slovak Republic, and the Slovak Academy of Sciences, Grant No. 1/0527/14, Grant No. 1/0584/13, Grant KEGA No. 016TU Z-4/2013, and Grant APVV-14-0506. Anthony, R. N. (1988). The Management Control Function, Harvard Business School Press, Boston, MA. Baumgartner, B. (1980). Controlling-Konzeption, Theoretische Darstelung/praktische Anwendung, [Controlling-Conception, Theoretical Introduction / Practical Aplication], Gabler Verlag, Bern-Stuttgart. Benčíková, D., Malá, D., and Minárová, M. (2013). “How culturally intelligent are Slovak small and medium business?,” Conference: 7th International Days of Statistics and Economics, Prague, Czech Republic, 109-121. Blazek, A., Deyhle, A, and Eiselmayer, K. (2002). Finanz-Controlling. Planung und Steuerung von Bilanzen und Finanzen [Financial Controlling. Planning and Management of Budget and Finance], Verlag für Controllingwissen, Berlin, Ger. Bieliková, T., Cút, S., and Úradniček, V. (2014). “The influence of the definition of risky company on financial situation diagnostic models in Slovak dynamic economic environment,” Conference: 7th International Scientific Conference on Managing and Modelling of Financial Risks, Ostrava: Czech Republic, 38-45. Claussen, H. (2003). “Instrumente für das Finanzcontrolling [Instruments for the Financial Controlling],” Controlling News 25(2), 17-18. Drábek, J., and Halaj, D. (2008). “Tools of increase a firms’ efficiency,” International Conference on Wood Processing and Furniture Production in South East and Central Europe – Innovation and Competitiveness, Belgrade: Serbia, 97-103. Drucker, P. F. (1981). “Controls, control and management,” Planung und Kontrolle, Steinmann, H. (ed. ), pp. 379-382, Auflage Oldenbourg, München, Germany. Eschenbach, R. (2004). Controlling, ASPI Publishing s.r.o., Prague, Czech Republic. Eschenbach, R., and Siller, H. (2011). Controlling Professionell: Konzeption und Werkzeuge, [Controlling Professionally: Conception and Tools], Schäffer-Poeschel Verlag für Wirtschaft Steuern Recht GmbH, Stuttgart, Germany. Fickert, R., Geuppert, F., and Künzle, A. (2003). Finanzcontrolling [Financial Controlling], Fr. 98.-Haupt Verlag, Bern, Switzerland. Fischer, T. M., Moller, K., and Schultze, W. (2012). Controlling-Grundlagen, Instrumente, Perspektiven [Controlling-Fundamentals, Instruments, Perspectives], Schäffer-Poeschel, Stuttgart, Germany. Foltínová, A. (2009). Nákladový Controlling [Cost Controlling], Iura Ed., Spol, Bratislava, Slovakia. Foltínová, A., and Belan, M. (1997). “Finančný controlling podniku II. Časť [Financial Controlling II. part] ,”Finančný Poradca Podnikateľa 7(4), 115-129. Freiberg, F. (1996). Finančný Controlling, Elita, Bratislava, Slovakia. Havlíček, K. (2011). Management and Controlling: Small Business, Vysoká Škola FinančNí a Správní, Prague, Czech Republic. Horváthová, J., and Gallo, P. (2003). Controlling, Dominanta, Prešov. Ismail, I. (2011). “The ability of EVA attributes in predicting company performance,” African Journal of Business Management 5(12), 4993-5000. Lesáková, L. (2008). “Influence of globalisation on small and medium enterprises,” Journal of Economics 56(6), 607-621. Klieštik, T., Musa, H., and Frajtlová-Michalíková, K. (2015). “Parametric methods for estimating the level of risk in finance,” International Conference on Applied Economics, ICOAE 2015, Procedia Economics and Finance 24(2015), 322-330. Mitro, P., Mudráková, K., Micková, H., Dudás, J., Kirsch, P., and Valocik, G. (2008). “Hemodynamic parameters and heart rate variability during a tilt test in relation to gene polymorphism of renin-angiotensin and serotonin system,” PACE-Pacing and Clinical Electrophysiology 31(12), 1571-1580. DOI: 10.1111/j.1540-8159.2008.01228.x. Musa, H., and Musová, Z. (2010). “Islamic finance and banking – Challenges and perspectives,” Conference: 5th International Scientific Conference on Managing and Modelling of Financial Risk, Ostrava, Czech Republic, 269-276. SAWP. (2014). “Sections of Association,” Slovak Association of Wood Processors, (http://www.zsdsr.sk/en/sections-of-association/) assessed on 02/09/2014. Scheer, L. (2007). Biometria [Biometrics], Technical Univ. in Zvolen, Zvolen, Slovakia. Sedliačiková, M. (2015). “Finančný kontroling v malých a stredných podnikoch – teória a prax,” [Financial controlling in theory and practice of small and medium enterprises], Technická univerzita vo Zvolene, Zvolen, Slovakia. Šatanová, A. (2005). “Uplatnenie controllingu vo vnútropodnikovom riadení, personálnom manažmente a manažérstve kvality podnikov DSP,” [The application of controlling to business, personal and quality management in woodworking enterprises], Technická univerzita vo Zvolene, Zvolen, Slovakia. Úradníček, V., and Zimková, E. (2009). “Synchronisation of Business Cycles – Cross Country Analyses,” Conference: 12th International Scientific Conf. on Appl. Math. & Statistics in Economy (AMSE 2009),Uherské Hradište, Czech Republic, 439-446. Závadský, J., and Hiadlovský, V. (2014). “The consistency of performance management system based on attributes of the performance indicator: An empirical study,” Quality Innovation Prosperity 18(1), 93-106. DOI: 10.12776/QIP.V18I1.314. Article submitted: August 22, 2015; Peer review completed: October 24, 2105; Revised version received: November 3, 2015; Accepted: November 5, 2015; Published: November 18, 2015.